Let’s face it; most parenting is adaptive as we learn to adjust to the little people who come into our lives. Just when we believe we have found an answer, they grow, change, evolve, and send us back to the drawing table. This month, Geoff made a bold mood. He decided, while I was taking Greta to dance after school, that he would load Carver’s bike and his hand cycle and make his way to the bike path just north of Franconia Notch. Incidentally, May 3 is also the anniversary of NH’s prolific symbol, the Old Man on the Mountain, falling off his rock foundation. Knowing Geoff, this is no coincidence. He and I became friends coaching soccer together, and he “wooed” me riding bikes along this same bike path. We would bike, stop, chat, bike some more, and Geoff would sometimes wistfully share what he missed about hiking in these White Mountains, trails off the Notch in particular. 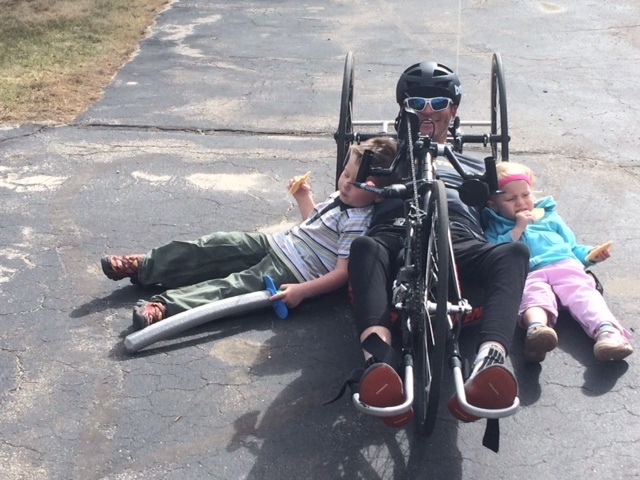 But soon after his accident, he learned to mountain bike, ski, and road cycle and is now learning to use a race wheelchair with the hope of competing in some road races this summer. But this isn’t really supposed to be about Geoff as much as it is about our kiddos adapting to our situation having one parent with a disability. Last year in kindergarten, Carver had been waiting all year for his turn to take home the stuffed class turtle and write about their adventure together! Little did Carver or Fred the turtle know Daddy would spring a cycling surprise on them after school. When Geoff told me he was taking Carver biking, I listened. I wanted to say, “Do you think that is a good idea by yourself? What if he wipes out on the trail? What if you run into a bear? What if you have a bike issue?” But I said none of these things, believing that Geoff sometimes needs to just jump in with both feet. Although Geoff would never purposefully put our kids in harm’s way, keeping them safe during toddlerhood isn’t easy for completely able bodied people; Geoff always worried he wouldn’t be able to keep them from running in front of a car or lost in the grocery store. But our kids are bigger now, and we have been turning corners all over the place, and even watching Carver illustrate his writing and carefully sound out each word amazed me. 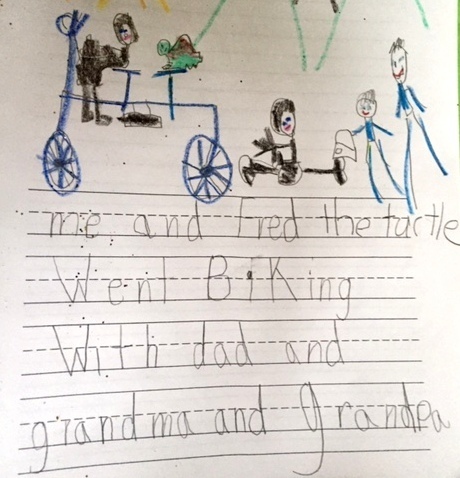 But seriously, he has drawn himself and Fred on a tandem bicycle, an obvious choice for a kid who has grown up around all sorts of kinds of bikes. Clearly, Fred was a stuffed turtle but even Carver suggested that he couldn’t be independent on a bike given that his legs weren’t long enough. “If stuffed turtles could drive, he would also need to use hand controls like Daddy,” explained Carver at age 6. He is now 7 and in first grade and equally challenging to protect from the bodily harm of taking jumps with his bike or wiping out on his scooter. He places himself in front of Daddy’s black hand cycle, which is smaller and seemingly less powerful than Carver’s hand- me- down bike, which has survived my friend Jolene’s boys, and probably others before them. The best part of the story comes when Carver tells me that Grandma and Grandpa Krill joined the expedition on foot. Geoff said he started thinking maybe someone should be nearby if he had an issue, so Grandma and Grandpa are wearing matching blue outfits and Grandma carries the bag that turtle was actually in for the adventure. Geoff thought through the situation and asked for a little back up, which is what any parent does when they might be in over their head or just looking for some preventative measures. Carver and Geoff also wear matching black Bern helmets, the same size in fact, crazy for boys almost 40 years apart in age. And that’s what it came down to– Geoff just wanted to take his little boy for a bike ride somewhere cool, and even though it probably took him longer to load all of the gear by himself than it did to complete a 30 minute bike ride, Geoff agrees it was all worth it. He told him the story of the Old Man of the Mountain again, and they practiced turning their wheels one rotation at a time. So don’t be surprised if you have an amputation, or live with paralysis or a disability in some other form, or maybe even have a weight issue, our kid is probably going to assume you still ride a bike. Why wouldn’t you? Heather Krill is a writer- wife- teacher-mom who lives in the White Mountains of NH with her husband, Geoff, a paraplegic and professional skier, and their two children, Carver and Greta who are 7 and 5. Please check out her novel ” True North”, website www.heatherkrill.com, and @heatherkrill1 on twitter.